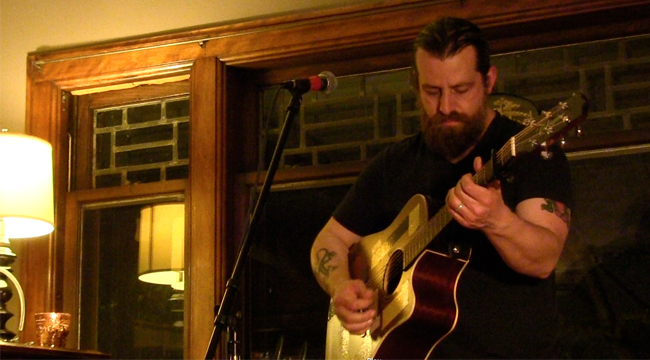 Singer-songwriter Sean Rowe has played everywhere from the little corner bar to late-night TV. His current tour brings him to the most intimate of stages, the living room. Sean has been traveling around the country playing house concerts, sharing songs from his upcoming album and giving fans a true front row seat. How has the house concert experience been so far? Really wild! The west coast leg was scenic, to say the least. From playing a house on the top of a mountain in Santa Barbara that was built almost entirely out of old hotel doors to performing at a 20,000-acre horse and cattle ranch in Parkfield, California with a population of 18 people, and then on to the tight-fit suburbs in Long Beach. They span across all kinds of places and all kinds of people. How long will this tour last? I started in late January and it will continue on until the end of August. Is there much down time? Do you get time to spend with your family, to read, to see the cities that you’re playing in? I actually usually end up staying overnight in the houses that I perform in. I hear all the “hot spots” from the hosts. Sometimes I’m able to check things out the day after—parks, museums, that kind of thing. One fan from Nashville pleaded with me to check out Prince’s Famous Hot Chicken, but I didn’t have time to make the pilgrimage. From your blog posts, it seems like you’ve seen a lot of cool places and met some interesting people. Any stories that you’d like to share? The smallest house show I played was in Maryland for about six people, but it was one of my favorites. They treated me like gold. I loved their stories and just how personal that show felt. One of the guests, a family friend, was demonstrating his famous karate move with a pair of nun chucks and accidentally took out the light fixture in the living room. It was awesome! How hard has it been, logistically, to plan this tour? All the credit for that goes to my wife, Christina. She’s been doing all the bookings for the house tour. There’s a lot of perks to having someone who knows you inside and out to route the tour. What cities are coming up on your schedule? A lot over the next couple months will happen just outside of the capital region in New York for May and June. We planned it that way so I could be around for a lot of the good foraging season for spring. I do a lot of wild crafting so I like to be around when the season is ripe. It seems that playing house concerts is a much more personal way of sharing your songs, almost a throwback to a time when families would get together and play music in the home. Do you feel that there’s a better interaction between you and the people who come to see you? Yeah, of course. There’s just a lot more time to get to know each other. Nothing feels forced and it’s as about as intimate as it gets. Are you playing some of the new songs at these shows? Yes, the house shows have been my guinea pigs for new material. It’s a great way to test this stuff since I’m so close to everyone’s face, I can see their reactions clearly. How is recording coming on the new album? Is there a release date? The record should be released early September. It’s all ready to go. After the new album is released, will you be going on another house concert tour to promote it, or playing traditional venues? I do plan on continuing with some house shows once the record comes out, but we’ll be grouping them in along side of public club shows as well. Do you have a preference between recording and playing live shows? Love them both really. They are such different animals. Live is always very immediate. You can’t go back and change what you did. It’s kind of like the musical equivalent to watercolor painting. You can follow Sean’s tour on his blog, http://rowehouseconcerts.com.